While in my car for only a short time daily (approx. 15-25 min. to and from work) I generally enjoy listening to Marketplace or one of the morning NPR shows. As of late though, I've been listening to the CCNA Cram Guide Audio version by Paul Browning (requires a paid membership). Its a quick 30 minute guide to some key notes for the exam. Although, after listening to it for a month, it can get a bit old and so I've started looking for something a bit more elaborate. 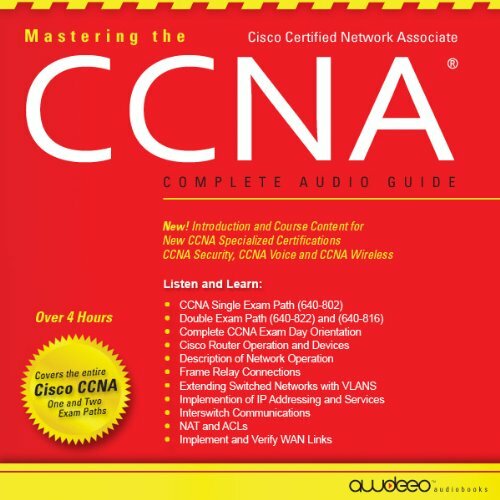 I believe I will end up with "Mastering the CCNA" audiobook as it see well put together and is still inexpensive at $14.95 US. With 4 hours of lecture it should go a bit more in depth than the Cram Guide. This is course is only supplemental to Sybex CCNA v7, The official CCNA Study Guide, Packet Tracer, and videos. Meanwhile, the search lead me to an interesting page on Apple's UK site, the "iTunes Store Top 10 Audiobooks - Technology". Interesingly, the US site doesn't appear to have this chart, yet the UK site includes the US statistic as its first listing. Additionally, I'm not sure what the interval is for the statistics. Still, it's an intereting chart and has some good audio books listed. *20110825 - I looked again today at the page and the statistics have changed. I suppose this means the updates are daily.